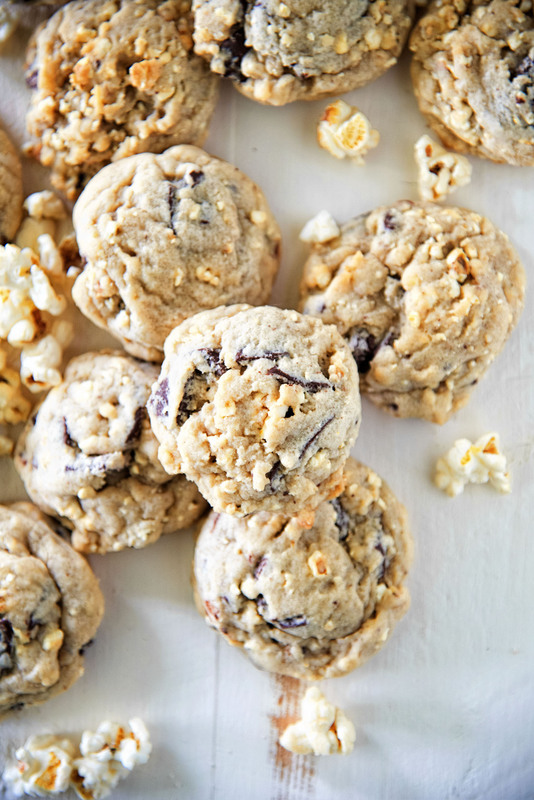 Kettle Corn Chocolate Chip Cookies: Classic chocolate chip cookies with the addition of salty sweet kettle corn. Sure to please the salty sweet lover in your family. My husband and I are addicted to the show Carnival Eats, it’s on the Cooking Channel. If you have not seen the show a guy named Noah goes around to different fairs and eats food at them. Rough life. In watching many seasons of this show I have decided that my style of baking is apparently carnival food. It’s funny to see how many ideas I had/have that are foods at the fair. They recently had a recipe for kettle corn soft serve ice cream sandwich. I had this idea too. Mine was slightly different but I have wanted to make kettle corn soft serve for forever. Only problem is I don’t have a soft serve ice cream machine. Which FYI I have an obsession of finding a used one under $500 one day. I search weekly for one. FYI it is impossible. If it wasn’t I would own one. Years ago I had the chance for basically a free one but I was living in an apartment at the time and had no room for it even in storage. It was a BIG machine. Anyway, I love Kettle Corn and love that you can finally buy it at the store instead of having to head to a festival to find it. And pay so much for it. I will admit fresh kettle corn is the best but the stuff in the bag is pretty good too. 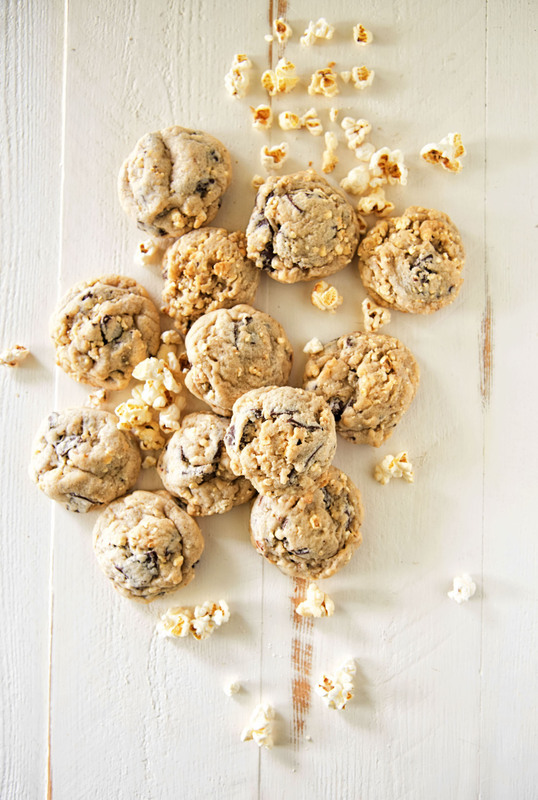 These cookies are best to eat the day of or else the kettle corn will soften up but really they still taste awesome either way. Using a stand mixer with the paddle attachment cream together the butter and the sugars until very light and fluffy, about 3 minutes on medium high. Scrape down the side of the bowl. Continue mixing while adding the eggs one at time. Make sure each egg is incorporated before adding the next. Add the vanilla extract and scrape down the bowl with a spatula. In a small bowl combine the flour, soda and salt and mix to combine. With the machine on low, slowly add the flour. Mix until just combined, taking care not to over mix. With the mixer on low add in the chocolate and kettle corn. Mix until the ingredients are distributed somewhat evenly. Roll cookie dough in to 1 inch balls. Bake at 360* for 12 minutes. 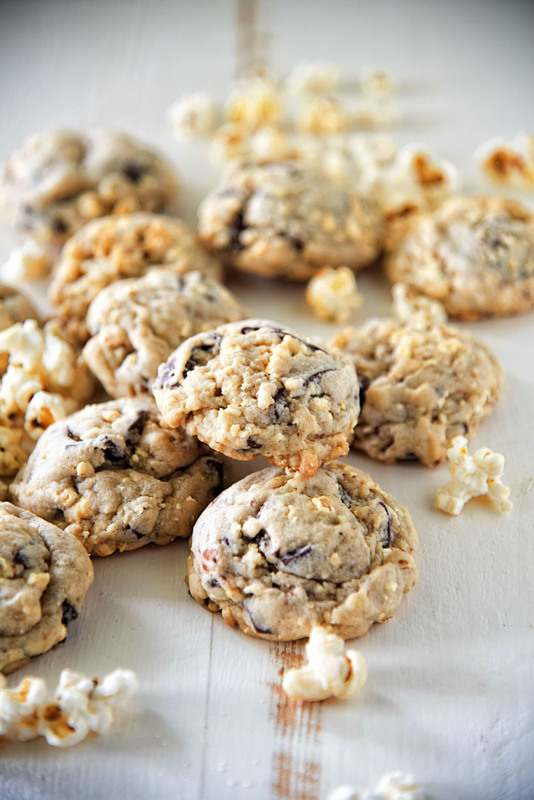 They should be lightly golden on the outside but still look gooey on the inside. *Please note that yes that reads 360 and not 350. If you oven does not go to that I would stay with 350 and bake an extra minute. Hi Peabody! I’ve missed you. Just wanted you to know I’m thinking about you and hoping all is well. Thanks. Our dog passed and it’s been hard on us.